This is a completely rewritten and updated, full-color follow-up to their 1985 book of almost the same name. The authors share their experience gained over the years, and also the knowledge of many respected people throughout the Pacific salmon fly-fishing community, including: lodge owners, guides, sportfishing club members, tackle manufacturers, biologists and technical experts; along with an elite group of legendary guides who have contributed so much to the sport. 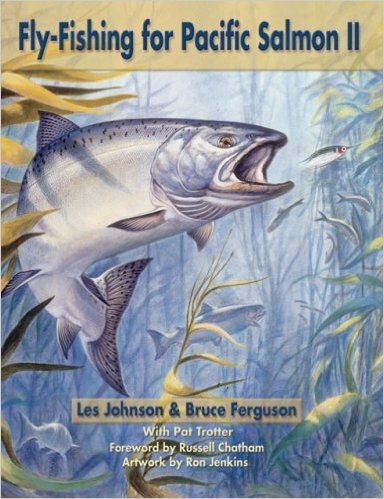 Comments from two different purchasers: "If you want to catch salmon the hard way, this is the book for you. Until I read Les's book, I didn't even know some of these angling techniques existed. For the diehard flyrodder/salmoneer -- It can be done. Wayne Heinz, author of, How to Catch Salmon, Sturgeon, Lingcod, Rockfish, and Halibut Along the Pacific Coast: Fish On!" and "Fly-Fishing for Pacific Salmon II is a must-have source of information for the West Coast fly angler. I heard Les Johnson, one of the authors, speak; Les knows his subject and generously passes along information. It is a book for the beginner as well as the experienced angler. The quality of the book paper, the illustrations and the type are all excellent. The writing is clear and to the point. I particularly liked the coverage of beach fishing that included what time of the year the salmon are found in various places as well as that they are feeding on. There are some surprises even for the experienced angler. The authors follow the salmon into fresh water and provide useful suggestions for fishing the rivers. The book also contains recommendations for what tackle to use and has an extensive chapter on salt and freshwater flies that provides enough information for the tyer to follow." Available from the NFA library (contact Jimmy Kamada) and here.